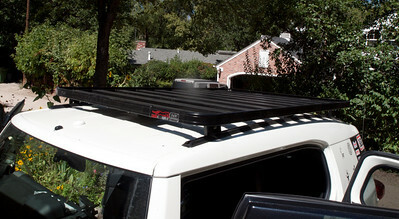 I am currently running the Front Runner Wind Cheetah Slimline Roof Rack on our Toyota FJ Cruiser. I chose this rack for its simple design and lack of side rails. The rack also includes a track system for attaching tie downs. The construction is of quality extruded alloy rails. Front Runner also has a lard number of accessories available for the rack. Chcek www.Equipt1.com for current dealers and prices.